Volkswagen and Mercedes take the 3-pin approach. Having previously dabbled in EVs, the German giants now aim their guns squarely at Tesla. Volkswagen’s ID concept previews a forthcoming production EV scheduled for production by 2020. It will also go fully autonomous by 2025, sitting alongside higher-end Golfs. Can I leave range anxiety at home? That’s the plan. The ID is the first recipient of VW’s Modular Electric Drive Kit (MEB – not Midlands Electricity Board) that is the electric equivalent of MQB and will underpin all future VW EVs. That means motor in the rear, batteries in the floor and ancillaries up front. VW says the ID is capable of at least 250 miles on a single charge, 0-62mph in under 8sec and 100mph. The ID tag doesn’t just refer to the car; it’s also the start of Volkswagen’s idea for each driver having a profile containing seat and climate settings, favourite radio stations and even contacts, all linked through the cloud via your phone. It can also link to your home, so you can spy via your comprehensive CCTV network. But when will we see this tech for real? Sooner than you think. VW says the first production ID will arrive within four years, so it will share underpinnings with the next Golf. 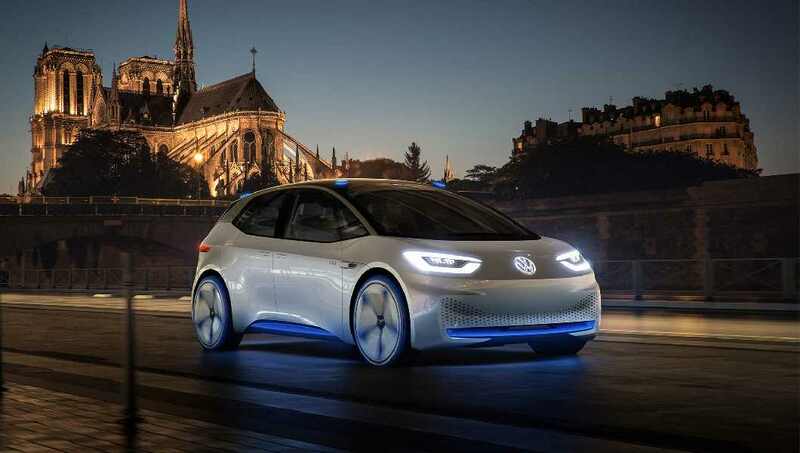 The automated driving tech is scheduled for 2025; touch the VW roundel on the steering wheel and it retracts, and the lighting changes to signal the car’s taken over. Party tricks aplenty from Volkswagen. As well as boring stuff like driving itself the ID can accept deliveries from your local online retailer if you’re away from home, park itself in a multi-storey and project augmented reality images on to the road ahead. Your elderly father might need some assistance with it. 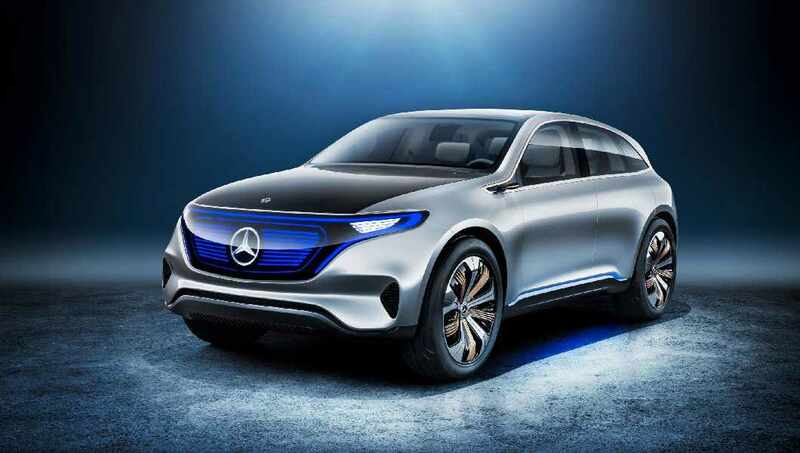 Purely a concept for now, the Generation EQ is a SUV-cumcoupe showing off Merc’s thinking not only on production EVs but also scalable electric architecture and next-gen interiors. Befitting its sporty SUV flavour, the Generation EQ has a mighty 400bhp and 516lb ft of torque distributed by a motor on each axle. With all that traction it belts to 62mph in under 5sec. Drive more sensibly and let the software manage the energy supply and the EQ can manage over 300 miles on a single charge. The Generation EQ previews a knob-free interior (no sniggering) made up of a vast 24-inch TFT screen, fully configurable by the driver and operated via touch-sensitive pads on the steering wheel spokes. It also ditches conventional mirrors in favour of cameras, while the internal door handles and window switches become all touchy-feely too. Not ideal for haphephobics. Forthcoming EVs from Mercedes-Benz will wear the EQ tag although it is a little more cagey about when we’ll see the first production car. As long as the global thirst for SUVs continues it’s a safe bet for the real thing to arrive by 2020 but the architecture could easily be slotted in to the next A-class. The EQ signals an end to the Merc owner’s nightmare of a stolen three-pointed star, as both ends wear LED fibre-optics that do the job of conventional badges, lights and indicators. As you approach it lights up the cabin and adjusts the hue depending on the state of charge – like sitting in a giant Duracell. very informative post yankee state on behalf of Pine Tree State as i am constantly searching for new content which will facilitate me and my knowledge grow higher.